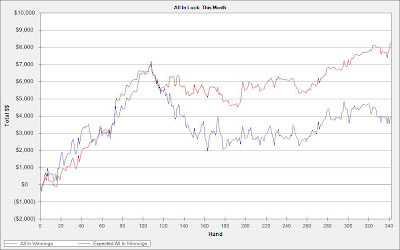 I'm choosing a somewhat fitting song title for this blog entry :P. People who don't play poker tend to think that we have nothing to worry about and have an easy life with the money we make at this game, as if the money was falling from the sky. How hard can it be to play cards and have the possibility to make more than a doctor if you are a successful player? They think it's easy. I can't tell you how wrong they are. Sometimes this game can be such a mindfuck. I don't want to elaborate on this but it can get really really hard on your mental, especially if you don't have proper balance in your life to help get through it. And you need the right people around you as well. I am glad I have some people that I care about to get my mind off poker. That said, I haven't updated my blog in a while because not much interesting has been happening. Since I've had PC problems I cannot post the graphs like I said I would unfortunately but don't worry I know exactly how much I made. I am up around $13,500 right now for the month, which is not too bad but at the same time if we consider I was up almost this much more than a week ago it's not very fun. But that's poker, and I mentioned it in the introduction post, there's nothing you can do about it except play your best. You can win a lot very fast just like you can have dry spells for a while or huge losing sessions even if you are making the right decisions. Let's hope this last week goes well, I am craving for some new motW songs! Wish me luck guys. Tough night. Guess it was going too well to be true, can't win every single day. It wouldn't affect me all that much if it wasn't for this project. Oh well. Picture won't show for some reason. I am down a total of $3000 tonight. Tough luck, hope I can recover in the next days, would become quite painful if it kept going down from now. No progress lately. My PC crapped out on me and after I fixed it, it asked me to activate my copy of Windows Vista or it kicks me out. Lesson to you folks; buy your operating systems. Soooo I ordered one and am waiting for it to arrive. During that time I cannot play much, I am using my moms laptop to play some tournaments here and there but so far I've had no luck at all in them. Think i'm up around $11,500 so far for the month so at least there's that. I've had this song in my head all day. My brother kept humming it. Hey guys. Quick little update on how I'm doing so far. This week has been really good to me, but this game is incredibly sick. As I am typing this I am feeling quite frustrated with how my day went, tells you how hard it can be on your emotions sometimes. But whatever, even though it was an horrible day I've had an amazing week. Let's keep hoping I can pull it off, but so far it is looking REALLY good. Also, I haven't been able to play as much as I wanted to. The weather is too nice here and my brother came and visit me for the whole week. Things are going great guys, I am still going strong. There is hope, lots of it. I am playing a GREAT game. I'm not one to brag but it is absolutely ridiculous how bad people are at poker and the edge that I have in those games, let's hope it keeps going my way, I need it more than ever. We're at the beginning of day 4 and I am already up $5000+ which is kind of ridiculous. This isn't sustainable on a large sample of hands though, unfortunately. Thanks for the support everyone, as usual. Yeah my titles will be motW songs. How cool? Very. Day 1 started folks, I'm feeling much better now. 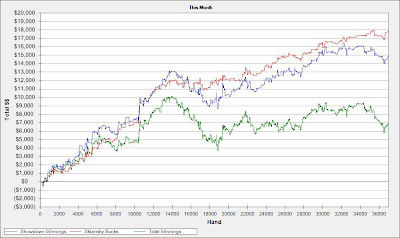 I'm tired though so I didn't play as much as I wanted to today, I will try to play 2500 hands at least every day though. I also won't update daily because it is annoying and meaningless, but i'll update my results for tonight just because we're off to a decent start (which is still meaningless but whatever).